With the holidays quickly approaching and November kicking off today, I thought the new month was perfect timing for a little kitchen makeover. Nothing too extravagant or involved, but enough changes to make it feel fresh and definitely more functional. Even though we moved in more than three years ago, John and I still feel like the space could work a little bit better, so we’re taking this season as an opportunity to rearrange a few things and give our retro kitchen a little more horsepower, if you will, when it comes to cooking and baking. 1. MORE STORAGE: The main thing we’re looking to do is add more storage. 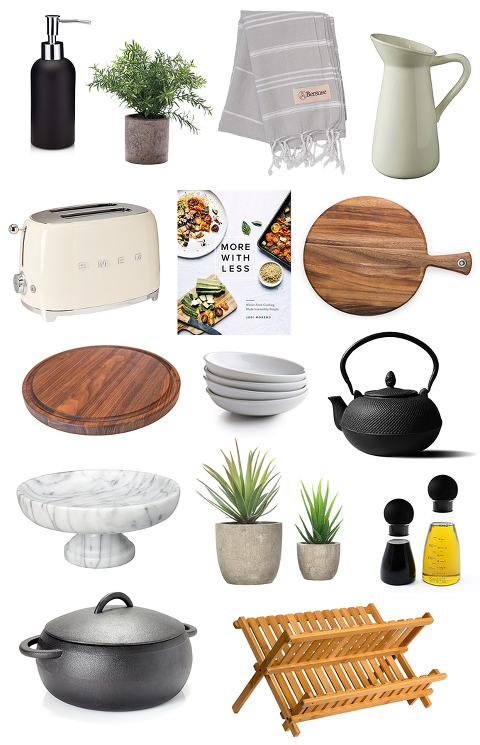 You probably picked up on it from the inspiration imagery I rounded up above, but I’ve got my heart set on bigger, more functional open shelving that can play host to more than just a few pretty accessories. I picture us grabbing plates, bowls, cups, and more off of these new shelves everyday, so I’m planning to build two deep shelves that can hold all of the above. 2. BETTER LIGHTING: We’ve never been all that pleased with the lighting in our kitchen. Right now, we just have the one overhead pendant fixture, but I’m hoping to incorporate under-cabinet lighting to help us see what we’re chopping and mixing after the sun goes down each evening. I ordered these battery-powered lights, and will share a full install post with you soon to show the difference they make. Fingers crossed they work as well as I hope! That mood board above is a pretty good representation of the look we’re going for. We’ll be focusing on replacing dated appliances and worse-for-wear accessories with modern, neutral-colored tools that look just as good as they function. Our toaster and pots and pans, for example, were wedding gifts from 2012 that could stand to be replaced with new versions that aren’t quite so scratched and dinged up after years of daily use. I’m going to spend the next few days and the weekend working on gathering new pieces and reorganizing, so hopefully I’ll be ready to publish the big reveal sometime late next week. 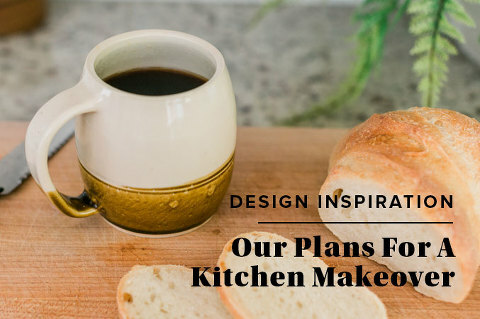 I’m so excited to show you how to transform your own kitchen with a few creative tricks and a budget-friendly shopping list, too, so I hope you’ll stay tuned! Let me know what you think of our plans (or if you have advice to share) in the comments below.